For the first time in five decades, 45 countries globally are enjoying improving economic fundamentals as tracked by the Organization for Economic Cooperation and Development. Global economic momentum has picked up with growth projected to rise 3.6% in 2017 and 3.7% in 2018. Business spending has been accelerating. Emerging markets in aggregate are growing for the first time in six years. Brazil is recovering from the worst downturn in a century. Japan recently recorded a surprising 4% GDP growth. Advances in smartphone technology and internet access are helping to fuel growing middle class prosperity. Positive fundamentals may finally lead to a shift in monetary policy as well. Since 2015, the European Central Bank has driven rates to zero or negative through $2.35 trillion in buying stimulus. On average, European junk bonds now yield less than US treasuries. This continues to propel a boom in private equity and leveraged buyouts, further shrinking the shares of public companies. In the US, pro-business policies in the form of regulatory rebalancing, a less onerous banking climate, tax reform and a strong rule of law continue to bolster investor sentiment. Since the inauguration, the flow of new government rules has slowed by 60%. The Economist. Rising home equity, low fuel prices (12-year low) and robust employment with rising wages are contributing to strong consumer spending which accounts for over 67% of the US economy. Increasing home equity loans should offer further stimulus in the months ahead. The rebuilding efforts following recent floods, earthquakes, hurricanes and devastating fires are invigorating construction. The services sector continues to show solid results. If the proposed tax reform passes and corporate rates drop to 20%, operating earnings for the S&P 500 could rise an additional 10% next year (Standard & Poor’s). While growth is improving, inflation is still relatively subdued due in large part to advances in technology and strong competition. Interest rates are being priced globally by the ECB and Japan so there really is not a free market at work for bonds. The effect of technological disruption has been dramatic in retail with the “Amazon effect” rapidly transforming how goods are delivered and consumed. A risk in exchange traded funds is that it is difficult to examine individual balance sheets and assess the operating reality and management of the underlying securities. Declining markets inspire panic if you don’t know what you own. US investors stampeded into Puerto Rico to take advantage of triple tax-exempt bonds in a frantic search for yield. The country of 3.8 million residents was flooded with “easy money” leading to crushing debt levels-$74 billion with another $25 billion in pension liabilities. General obligation bonds with a coupon rate of 8% have recently declined to 35 cents on the dollar. Toys “R” Us bonds recently dropped from 80 cents to under 20 cents on the dollar. The extreme debt levels of Payless ShoeSource and Sports Authority led to bankruptcy filings for both, sending negative shockwaves throughout the sporting goods, footwear and apparel markets. Cheap financing tends to lead to sloppy capital allocation in good times. Currently there is very little protection for bondholders as bond covenants are nearly nonexistent. AT&T’s borrowing for acquisitions recently exceeded $250 billion, not including leases, which dramatically increases the company’s vulnerability in a downturn. Traditional “safe havens” like food and packaged goods are under attack as innovation and private label offerings proliferate. Price wars and competition are intense in grocery and food delivery. Data is the fuel for artificial intelligence. Data is the new battleground. Companies that execute and aggressively invest in predictive data analytics are being rewarded with premium valuations in the market. Digital disruption is transforming numerous industries and companies. Streaming is upending traditional cable and broadcast media. 1.5 billion users of YouTube watch 60 minutes a day on mobile devices. In addition, 100 million hours are watched on YouTube television, up 70% over the past year. There is a plethora of content in media with too many outlets for viewing. Movie theatres are suffering. Online retailers with delivery choices are hurting traditional brick and mortar stores, especially malls. Younger customers tend to be more health-conscious and customization with product integrity is important. A dedicated daily fact-finding research effort has never been more important in allocating capital into areas that can continue to survive and thrive. Buy hold and forget can be hazardous in today’s world as the pace of digital disruption accelerates. Eastman Kodak and Polaroid were once part of the Nifty Fifty in 1973, where conventional wisdom suggested you could buy the 50 top growth stocks of the time without regard to “price and value” then hold forever. Not only did they crash due to extreme bubble valuations, they also suffered from changing technological trends. We are seeing many industries where a “winner take all” phenomenon is taking place, so analyzing and monitoring business models becomes even more critical. Hurricane Harvey closed almost 25% of US refining capacity. LyondellBasell is a Netherlands-based chemicals producer and one of the largest independent chemical manufacturers in the United States with operations headquarters in Houston. The stock recently traded down to 9 times earnings on a glut in ethylene, yielding 4.5%. With the hurricane, ethylene went from a glut to shortage adding to stronger pricing. The chemical sector continues to be ripe for consolidation. The Dow Chemical Company and E.I. du Pont de Nemours successfully completed their planned $130B merger to form DowDuPont (DWDP). Edward Breen from DuPont became CEO, and Andrew Liveris from Dow became chairman of the board. Mr. Breen has a strong track record in allocating capital. He successfully restructured Tyco, returning more than 600% over a ten-year period. DowDuPont plans to split into three publicly-traded companies within the next 18 months – Material Sciences, Specialty Products, and Agriculture. The most recent plan now expects Material Sciences to bring in $40B in annual revenue, Specialty Products $21B, and Agriculture $14B. Management plans to cut $3B in yearly costs and increase growth synergies by $1 billion annually with savings occurring within 24 months. If the global central banks pull back on bond buying and interest rates do rise, we are seeking companies that can do well in such an environment. Bank of New York fits the bill. Bank of New York Mellon operates as a custodian bank that holds assets for institutional clients and provides the back-end accounting services to keep everything running smoothly. They tend to thrive in a rising rate environment and recently earned 21% return on tangible equity while selling for a reasonable 13 times projected 12-month earnings. CEO Charles W. Scharf is an exceptional manager who helped transform Visa into a powerhouse through an in-depth understanding and heavy investments in technology. We see the potential for a double play—improved earnings and expanding price-to-earnings ratio. Auxier Focus Fund’s Investor Class returned 1.55% in third quarter vs. 4.48% for the S&P 500 Index. For the nine months of 2017 the Fund returned 11.39% vs 14.24%. The stocks in the Fund returned 1.90% for the quarter and 13.35% through three quarters. Domestic stocks comprised 78% and foreign 15%, with cash and “workouts” 7%. Since inception at the top of the market in 1999, a hypothetical $10,000 investment in the Fund, has grown to $36,348, with an average equity exposure of 78% compared to $25,466 for the fully invested S&P 500. Recently, the more defensive names in the Fund have lagged in the quarter as economic growth surprised on the upside. The more cyclical oriented names have been stronger. High debt levels have driven our conservatism. Today US government debt is more than 100% of GDP which historically has proved to be a major headwind for growth. A pick up in the global economy has improved operating momentum at Mastercard. Over two-thirds of their volume comes from outside of the US as Mastercard continues to push towards international growth opportunities. The digital trends away from cash together with higher spending have contributed to improving fundamentals. Mastercard is a proxy for global spending. Companies that execute with a powerful network effect are enjoying premium valuations. In the past quarter, Mexico’s Supreme Court ruled that a law allowing other competitors to use America Movil’s network free of charge was unconstitutional. Although this was a win, the court also decided AT&T and Telefonica would not have to retroactively pay back an estimated $600M to $800M in fees. The Federal Telecommunications Institute is expected to decide on a rate to be paid to America Movil in the next month. Biogen has been one of the most focused companies on research in neurological brain and myelin related diseases such as MS, Parkinson’s, ALS and Alzheimer’s. They may have a leading position in the treatment of Alzheimer’s with the drug aducanumab. The memory loss and functional decline in Alzheimer’s is linked to amyloid plaques, which are abnormal deposits built up in the brain. That’s where aducanumab, an antibody that “binds” to amyloid plaque in the brain, comes in. Based on preclinical and Phase 1B trials to date, treatment with aducanumab has been shown to reduce plaque levels. Alzheimer’s is now the top killer in the UK. Biogen continues to drive innovation in neuroscience using biomarkers, biological mechanisms and other cutting-edge therapies. In July, Microsoft announced a reorganization overhaul to encourage cloud growth that will cut up to 3,000 jobs in sales positions primarily outside of the US. This reorganization will be focused on how sales are handled as opposed to cutting costs. Azure, Microsoft’s cloud business, continues to show exciting progress. The company has returned $200 billion to shareholders the past ten years. In their second quarter, BP posted a profit of $144M, up from a loss of $1.4B in the previous year. BP recently announced their plan to issue an initial public offering of its US Midwest and Gulf Coast pipeline assets in the fourth quarter of 2017. BP Midstream Partners would spin-off in a Master Limited Partnership to raise cash and enter a tax-advantaged structure. Stronger global growth with the cutbacks in OPEC supply have helped to reduce the glut of oil. Visa saw payment volume growth of 38% to $1.9 trillion and total processed transactions of 28.5 billion, up 44% over last year and is looking at annual net revenue growth of 20% in 2017. Like Mastercard, Visa benefited from the shift to electronic payments and an uptick in global spending. PayPal is a smaller position we own, and it is enjoying exemplary execution in the payments space. UnitedHealth has continued to outperform on its strategy of evolving from disease management to predictive approaches leading to material reductions in medical costs. Their data and technology platform, Optum, produced double digit percentage earnings growth in all its segments. This company continued to expand its lead in predictive data analytics. Unilever delivered a strong performance in the first half of the year as net profits increased over 22% and turnover increased 5.5% while all four of its core segments showed improved margins. Group volume remained relatively flat in the first six months, but management anticipates accelerating growth in the second half of the year on the back of innovation plans and increased marketing spend. Boeing shares experienced their largest jump in value since 2009, growing more than 8% to an ever-increasing record high price after releasing impressive quarterly earnings. Revenues were down 8% due to planned cuts, but through lower production and development spending, Boeing was able to greatly improve profit and cash flow while benefiting from high demand for air travel. Medtronic experienced an IT system crash in the quarter that left them unable to process, ship, and manufacture orders for a week. Demand for their automated insulin dosing sensors has more than doubled in the past ten quarters, outstripping production capacity. Accelerated plans to increase capacity are not expected to be ready for commercial production until Q4, leaving less units available for the higher revenue generating new patient system sales. The company suffered damage to manufacturing facilities in Puerto Rico from Hurricane Maria. Medtronic is a very cheap market leader for the quality, based on improving free cash flow and a high return on invested capital. Zimmer lowered its full year revenue guidance by 1.5% after experiencing production delays and slower-than-expected sales recapture from customers in the US. David Dvorak unexpectedly resigned as CEO and from the board of directors in July, but many see this as a possible positive and a step in the right direction. Zimmer is the low-cost producer of hips and knees and is well positioned to serve worn out, aging baby boomers. Increasing competition in the grocery industry led to lower average spending per customer visit and continues to put pressure on their already slimming margins. Price wars in the grocery business are impacting all grocery participants. However, Kroger is a leader in the use of data analytics and is a very focused competitor, having successfully competed with Wal-Mart Stores for several years. Eating at home offers the best bargain in decades versus eating out at restaurants. News of the proposed 9-10% cut in reimbursement rates for clinical laboratory tests by the Centers for Medicare and Medicaid Services caused shares of Quest to drop more than 7.3%. As a result of the recent hurricanes and having a large presence in Florida and Texas, Quest expects a 1.5% reduction in revenues and a negative $0.10 EPS impact in the third quarter, per their 9/27/2017 press release. With a stronger employment picture, utilization rates look to improve. Despite delivering increasing constant currency revenues, diminishing demand for beer and increasing competition from microbreweries lowered the valuation for Molson Coors in recent months. Generation Z–those born on or after 1996–are estimated to be drinking 20% less than millennials and are the first generation to prefer spirits over beer. Oracle has been benefiting from the ongoing rapid growth and success of its cloud platform, but shares took a dive when they forecasted cloud revenue would increase between 39% and 49% in the quarter versus 51% in the previous quarter. We have never seen so many investment decisions driven by mathematical quantitative systems. In 1998, Long-Term Capital Management with more PhDs on staff than any investment firm in the world collapsed as it relied on mathematical models that supported borrowing over $200 billion on a $2 billion equity base. The next year passive “indexing” peaked as the market hit the highest price to GDP in history. A painful 40% decline followed. A contributing factor to the 1987 stock market crash was the belief that institutions had “portfolio insurance” which failed badly when the herd headed for the exits. Today many participants in the market are attracted to pools of stocks in the form of exchange traded funds that greatly outnumber the shares of publicly traded companies. If the fundamentals of the market turn down, it will be difficult to break out the operating reality of the underlying securities. The emotions and behavior of crowds tend to be predictable over time with little tolerance for declines. 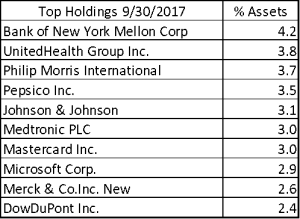 There is scant managerial ownership of these funds (no skin in the game) and the holding period tends to be over months not years. Buying overpriced assets blindly for free is no bargain at all. We prefer to know the business, management and balance sheet so when times get tough we have a good idea of the fundamentals based on years of day-to-day research. Having negotiated through numerous recessions and market declines over many years, we have seen no effective shortcuts to risk management. Our focus continues to be on approaching markets in a systematic, disciplined way, never losing sight of the power of compounding. We look at the potential loss of each holding constantly and seek to add value through the mitigation of undue risk. Before investing you should carefully consider the Fund’s investment objectives, risks, charges and expenses. This and other information is in the prospectus, a copy of which may be obtained by calling (877) 328-9437 or visiting the Fund’s website. Please read the prospectus carefully before you invest. Fund returns (i) assume the reinvestment of all dividends and capital gain distributions and (ii) would have been lower during the period if certain fees and expenses had not been waived. Performance shown is for the Fund’s Investor Class shares; returns for other share classes will vary. 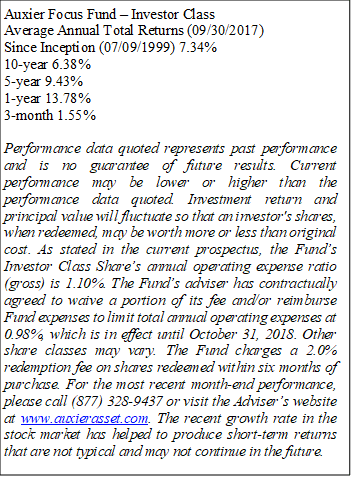 Performance for Investor Class shares for periods prior to December 10, 2004 reflects performance of the applicable share class of Auxier Focus Fund, a series of Unified Series Trust (the “Predecessor Fund”). Prior to January 3, 2003, the Predecessor Fund was a series of Ameriprime Funds. The performance of the Fund’s Investor Class shares for the period prior to December 10, 2004 reflects the expenses of the Predecessor Fund. The Fund may invest in value and/or growth stocks. Investments in value stocks are subject to risk that their intrinsic value may never be realized and investments in growth stocks may be susceptible to rapid price swings, especially during periods of economic uncertainty. In addition, the Fund may invest in mid-sized companies which generally carry greater risk than is customarily associated with larger companies. Moreover, if the Fund’s portfolio is overweighted in a sector, any negative development affecting that sector will have a greater impact on the Fund than a fund that is not overweighted in that sector. An increase in interest rates typically causes a fall in the value of a debt security (Fixed-Income Securities Risk) with corresponding changes to the Fund’s value. The S&P 500 Index is a broad-based, unmanaged measurement of changes in stock market conditions based on 500 widely held common stocks. One cannot invest directly in an index or average. The views in this shareholder letter were those of the Fund Manager as of the letter’s publication date and may not reflect his views on the date this letter is first distributed or anytime thereafter. These views are intended to assist readers in understanding the Fund’s investment methodology and do not constitute investment advice. © 2006-2019 Auxier Asset Management, LLC.